Patient Intake Coordinator ~ Chrissy became a part of the High Pointe Family recently in May 2018. She is an original Clarksville native where she met her husband of 6 years Joshua Dachtler. They have two amazing children. Adalynn 12, an exceptional gymnast with such a lovable personality and Ayden 11, an adventurous kind hearted little Ninja. Their family lives on a small farm in the country with 3 fur babies Kanoot, Rosey Mae, and Tucker along with 5 cows. They have hopes in the near future in growing their farm. Chrissy has been working in the medical field for 10 years. 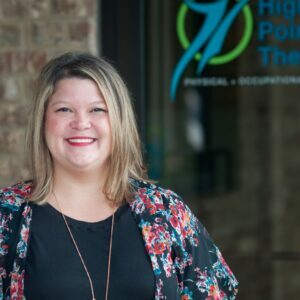 Her main responsibilities at High Pointe include checking in patients, scheduling appointments, and helping our patients have everything they need to begin therapy. She believes it is truly rewarding to help others by being a part of something that makes others feel better. When not working, she enjoys date nights with her husband, spending time with her family, antique shopping, gardening, bonfires, and grilling out with friends.